Well then, let's try another - What is art useful for? Here is where the confused herd separates. There are those (usually, very deep in the art world) that believe art can do anything. Then, there are those that believe it is ideal for raising conceptual and philosophical questions. And there are those who think art is useful on a purely aesthetic ‘it’s pleasant to have - but not essential’ grounds. An indulgent luxury item, so to speak. Lastly there are those who get art purely to tick a government-dictated box on a DA form. As someone who exists in the rare middle ground between the art and corporate worlds, I’m here to tell you: the third and fourth groups are wrong. This is because today, investing in art has become essential for your company’s survival. Dramatic, no? But give me a moment to explain the connection between art and the every so juicy millennial market. No longer dismissed as avocado-munching, social media-addicted kids, this group is the new consumer market businesses (and governments) are desperate to target. Forbes says that those born between 1981 and ‘96 are “quickly becoming the most important consumers encountered by most types of business.” According to Micah Solomon, millenials have “a spending power that is estimated to be worth $10 trillion over their lifetimes”. (forbes.com.au). And Gen Z are close on their heels. For obvious reasons, companies are now clamouring to have a piece of the pie. They’ve also become a strength to be recognised as future employees. Attracting the best graduates is no longer about pay for this generation - it’s also about prestige, personal investment, culture and the pure excitement value that is gained from working for a particular company. Exciting and Unusual: Put a high-value on the experiential and out of the ordinary. Art is the ideal medium by which companies can engage with this upsurge of experience-hungry consumers. A stimulating piece of art provides an experience and communicates company values and ideals. If what it communicates is in tone of self-betterment (for example, it advertises strong values on indigenous rights, sustainability and creativity) it will appeal to the Millenial-Gen Z coalition. An example? Take the long-held tradition of lobby art. Although it’s generally understood to be the front-facing part of the brand, in the past it’s never been considered the most exciting or experiential of art. Instead it’s safer to say companies often go for the vanilla option in terms of the art sundae. But why go for that when you could have the milk chocolate peanut fudge feat. miniature fireworks and data-enhanced sprinkles? I’m beginning to notice a trend: more innovative companies are investing time and effort into how they use culture to brand themselves. They realise art is on of the most effective ways to communicate about themselves. For example, take the ridiculously amazing/cool Boston-based ‘Media Band.’ A reactive digital artwork (designed by ESI Design), the 25-metre long panel interacts with tenants and visitors as they walk past. My favourite one of its three modes (Bay mode) sees marine wildlife native to the area fill the space. A ‘wave of jellyfish [emerge]’ if a curious tenant approaches the band for a period of time. Created for a LaSalle Investment Management Property in Boston, this site-specific artwork does three things for Millenial-Gen Z’s who are potential employees, tenants and collaborators. Exciting and Unusual: Offers an experiential moment. It is exciting and ‘outside normality’. Idealistic: It demonstrates the company ideals: Innovative, locally focused and daring. Self-Betterment: It offers a chance of ‘betterment’ through alignment of viewers with the creators of this incredible artwork (e.g. the commissioning company). In terms of digital art, Art Pharmacy Consulting recently collaborated with real estate investment firm, ISPT, to curate a 12-month digital placemaking project. 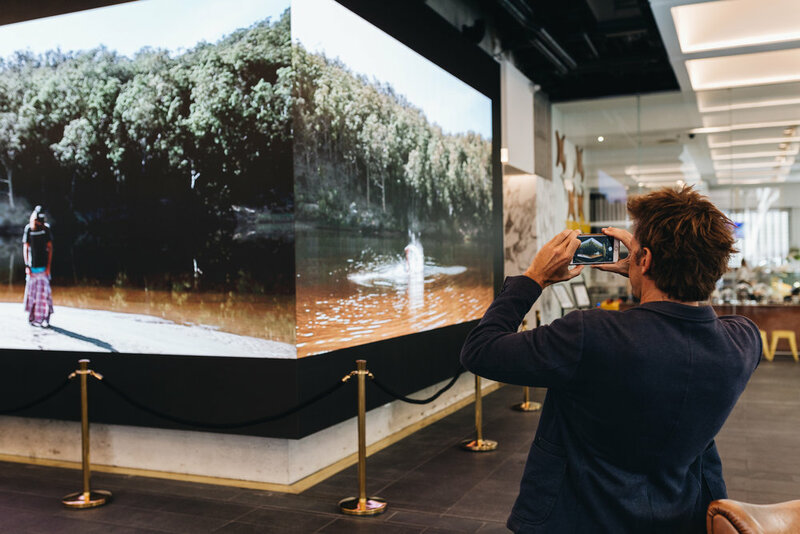 Four local artists were chosen to create hyper-local content for a 4X12 metre double screen in their Brisbane offices. 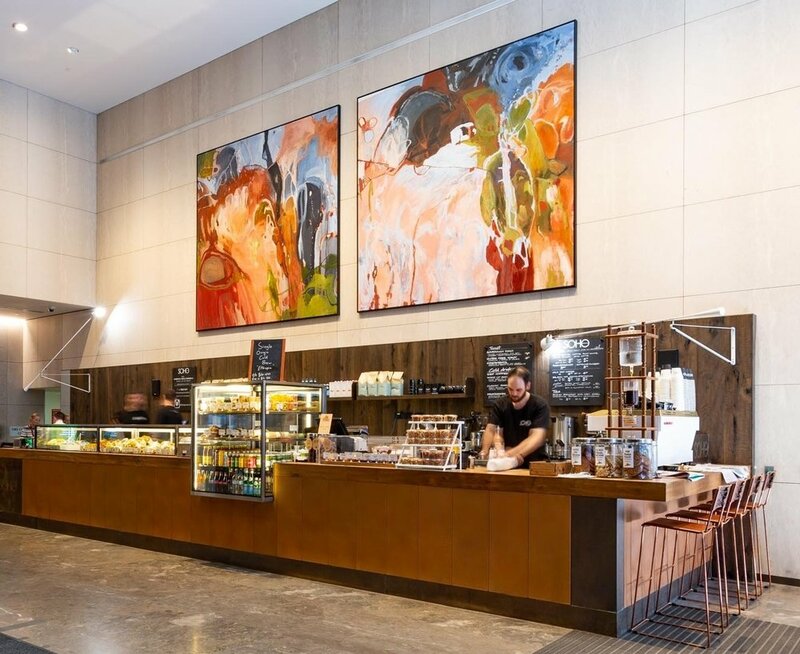 Upon entry, visitors and workers were greeted with a digital artwork, reminiscent of a contemporary Australian impressionist representation of country. An experiential moment like this draws attention to the brand, while its evolving and inspirational nature says something about its values. This art says they are cutting edge and one to watch. It says - you should want to work with us. Still don’t buy that this generation are any different to those previous? Well whip that paper bag of your head, so you can get a load of these figures: According to PWC’s Experience is Everything report (2018), Gen Z customers will pay more for customer experience in elements of brand personality (32% up from 19%), Design (59% up from 50%) and (my favourite) Fun (60% from 52%). So, though it might be awfully tempting to go for that abstract blue canvas, which may have been cutting edge seventy years ago (but sure isn’t now) you might want to have a rethink. Because while you keep running in the same decades-old hamster wheel, your competitors are already light years ahead in attracting new talent and customers.